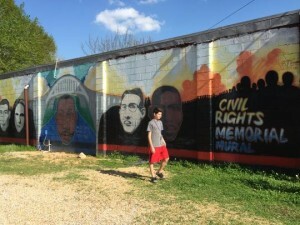 So when the movie Selma came out last December, depicting the events that led 600 civil rights marchers to cross the Edmund Pettus bridge in Selma, Alabama in 1965, it seemed a ripe opportunity to add to the lesson. Simon and I watched the film together, and it was just a few weeks later when I announced we’d be taking a special trip together — a three-day journey to the deep South to learn more about civil rights. “A what kind of trip?” Simon asked when I first broke the news we’d be going. I knew that an education-filled bus trip was hardly the top vacation choice for your average teenager. But I also knew that this type of opportunity — a trip geared toward kids his age, and already including two of his close friends — doesn’t come around every day.